As promised, I framed my Gingerbread Cottage today and took pictures of the process to perhaps aid those interested in doing their own framing. This method utilizes the pinning method as opposed to the lacing method. 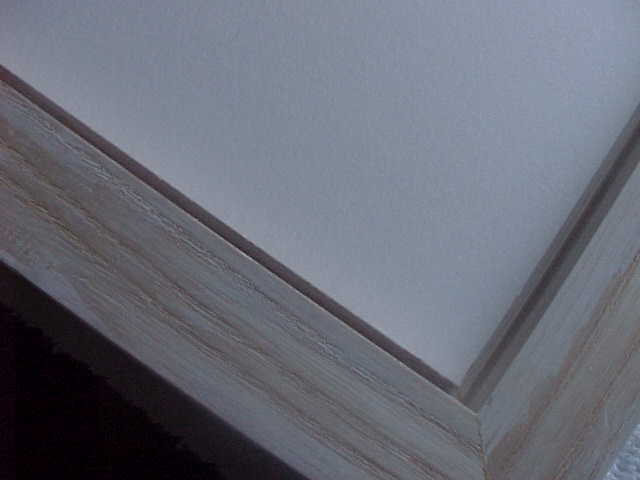 Doing your own framing is not difficult, nor very expensive. The most expensive tool required is a Point Driver which runs about $75.00 and is pictured below on the far right. Mine is made by Fletcher and is called the Fleximaster. You will require acid free foamcore which comes in two thicknesses – single and double. The double thickness is about 3/16″ thick. 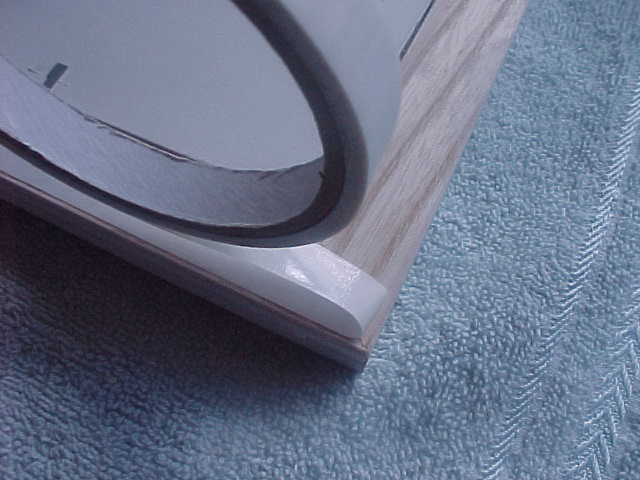 Single thickness is 1/8″ in thickness. Foamcore board is as the name implies – a thin core of foam sided with thin matboard like material. 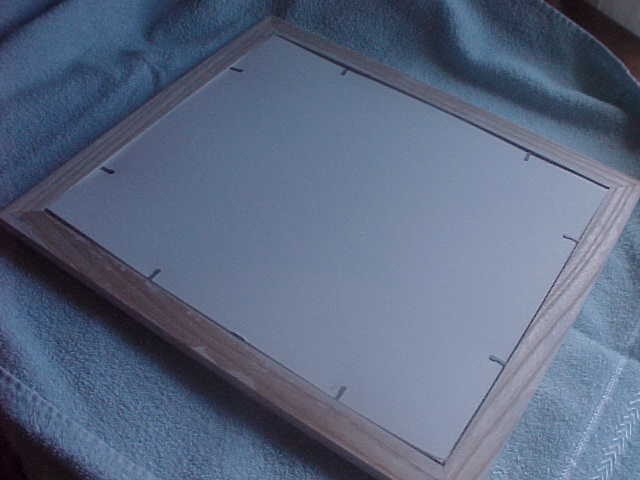 The thickness of the foamcore that you use is dependent on the width of the rabbet on your selected frame. The rabbet is the depth of the frame that you plop everything into – your glass, mats, pinned needlework on foamcore, and scrap matboard backing. 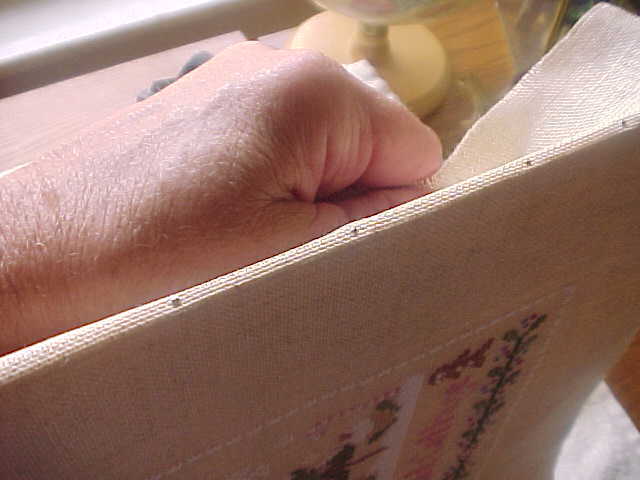 Occasionally I use “spacers” which are hollow plastic squared tubes that are placed at the edge of the rabbet in between the frame and your needlework. It’s purpose is to prevent the glass from setting directly on your needlework either because you have might have materials that stick up, like JABCO buttons, or you aren’t using mats and your needlework needs to “breathe”. I have elected not to use spacers on this piece because I’m using a double mat which provides enough breathing room. And I’m using single foamcore because the depth of my rabbet isn’t all that accomodating. I have bought foamcore from the online store listed at the bottom of the tutorial and just purchased 2 large thin pieces from my LNS at a cost of $7.50/ea. My LNS charges me just slightly more than their cost which is awfully nice of them. I purchased the glass, mats and frame from them and my bill was under $50.00, so with some time and a few materials I can have a framed piece that would cost over $100.00 for someone else to do. BTW, I just recently saw acid free foamcore at Michael’s in the art section by the poster board. The sheets are 32″ X 40″ and would be a good deal with a 40% off coupon!! Pictured below are some of the tools needed for this framing job. 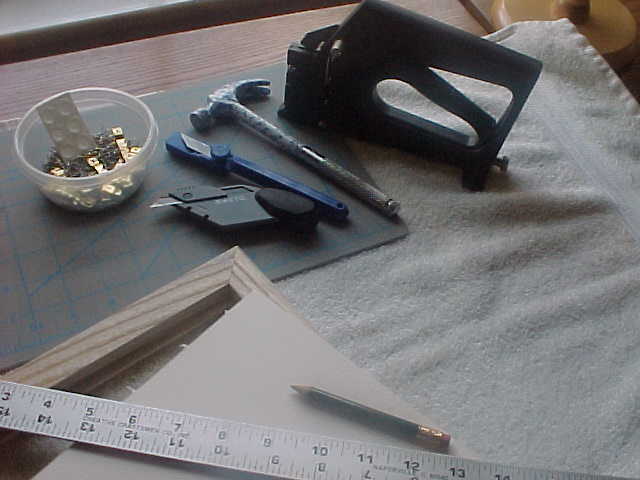 Your frame, glass, mats, cleaned and pressed needlework, cutting mat, pins, ruler, pencil, scissors, assorted job cutting Xacto knives, hammer, pins, double sided tape, artist’s tape, and a point driver. Pins used in this application are NOT straight pins. Well, they are straight pins, lol, but they don’t have a head on them like regular straight pins which are kind of knobby and convex. The head on the pins we use is flat and they aren’t quite as long as a regular straight pin. They also need to be nickel plated because of the rust issue. They are available in any craft or fabric store. Start with a clean protected workspace, using towels or something soft and cushiony to protect your frame from scratches and to capture wayward pins. Measure the length and width of the inside of your frame and cut your foamcore approximately 1/8″ less than measured to allow for the material and pins on the edge. The foamcore is cut on my cutting mat using the gray tool marked Xacto in the tools picture above. 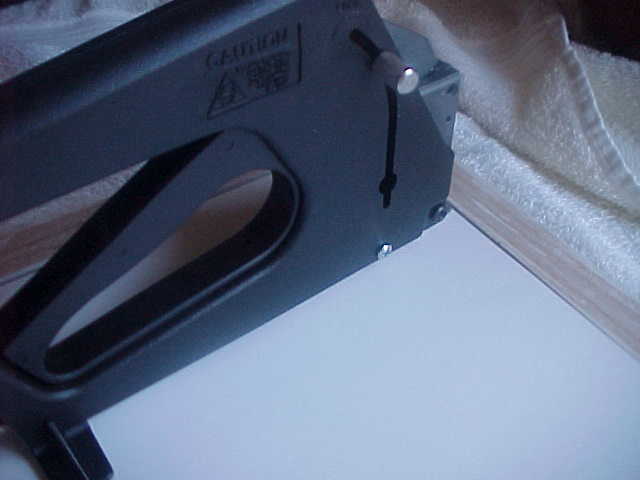 It is made specifically for cutting foamcore and like materials. There is a small knob on the underside that loosens the blade and will allow you to move it up and down as needed for the depth of what you’re going to cut. I really don’t have a precise scientific method for centering my needlework on my foamcore board. I kind of eyeball it and start pinning, adjusting as necessary. This is the most critical and time consuming part of the whole process. I pin, unpin, place it in the frame with the mats, measure, pin, unpin. You get the idea. You need to have the same amount of threads showing all around and your vertical and horizontal thread lines need to run parallel to the edges of your mats. Stretch as you pin, making sure that you stretch straight outwards and not to either side or you will end up with it stretching sidewickered. I place my pins about 1/4 inch apart. When you’re completely happy with your centering and pinning, it’s time to turn it over and use acid free Artist’s Tape (available at any craft store) to secure your excess material to the back of the foamcore. I made a big faux pas here. I didn’t intend to use mats on my piece initially. However, while at the frame shop, I decided to go with mats. 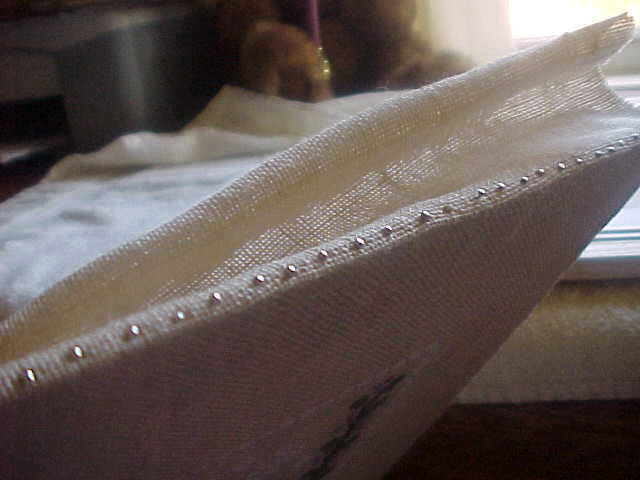 As a result I didn’t have quite enough material at the top and bottom of my needlework to bring to the back and to miter my corners correctly. What I should have done was sewn material to that top and bottom piece, however, I am not patient and often quite lazy and therefore decided to do it Carol’s way which was to squeeze whatever I could over the edge and tape it. Artist’s tape is quite the wonder. It is acid free and doesn’t leave a residue when peeled away. 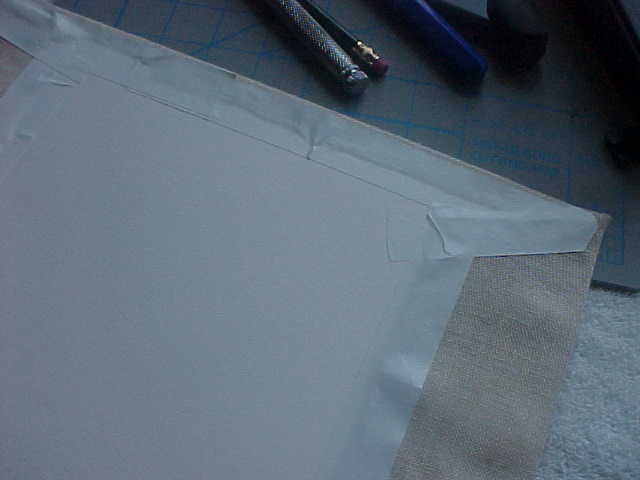 Anyhoo, if you use the proper amount of material on the edges of your piece, you will miter the corners and use the artist tape all around to secure. Cut a piece of acid free scrap matboard using the same cutter that was used to cut the foamcore. 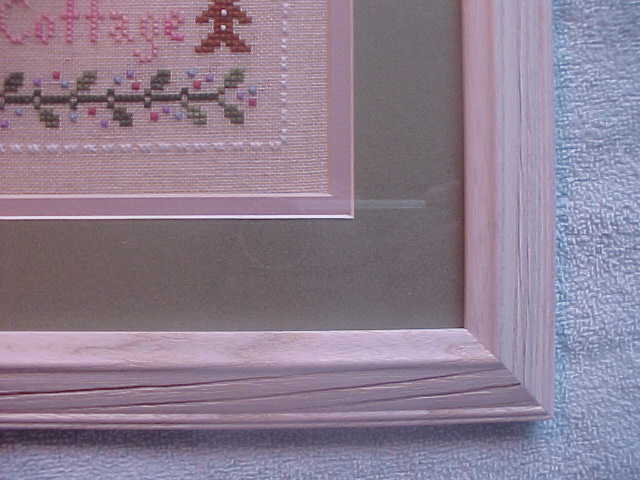 Assemble your framed piece by placing your glass in your frame, then the mats, pinned needlework, and finally the matboard. Turn everything over and make sure that your piece is perfect – no lint, wayward threads, etc. Using your point driver, drive framing points into the frame to secure all of it. As you can see in the picture below, it all sandwiched together quite neatly and comes flush to the back of my frame as intended. Now it’s time to apply the dust cover. I purchased my roll at Michael’s, a local craft shop. 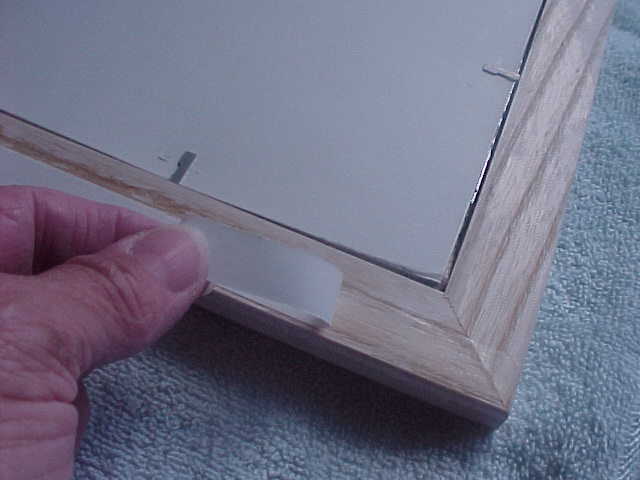 Apply double sided tape all around the edge of your frame, one edge at a time, leaving about 1/8″ at the very edge exposed. 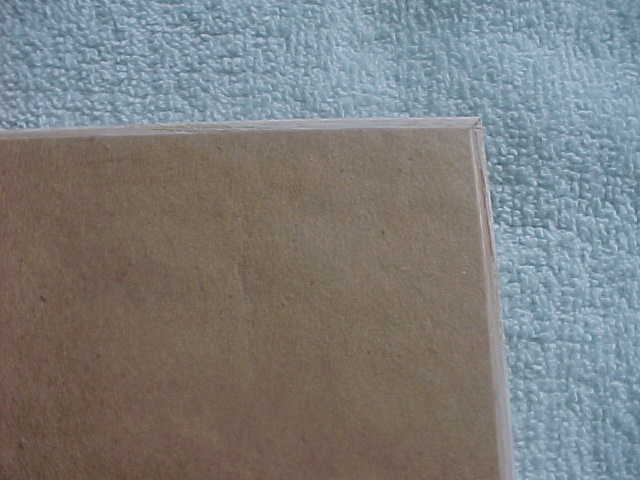 BTW, remove the white paper backing from each edge before proceeding to the next edge. Voice of experince here, lol. Cut your dust cover just slightly bigger than your frame. Starting at the top, lightly press the dust cover down over the double sided tape, smoothing as you go. Be careful, because you can’t lift it off if you make a mistake or get a wrinkle without messing it up and having to start over. 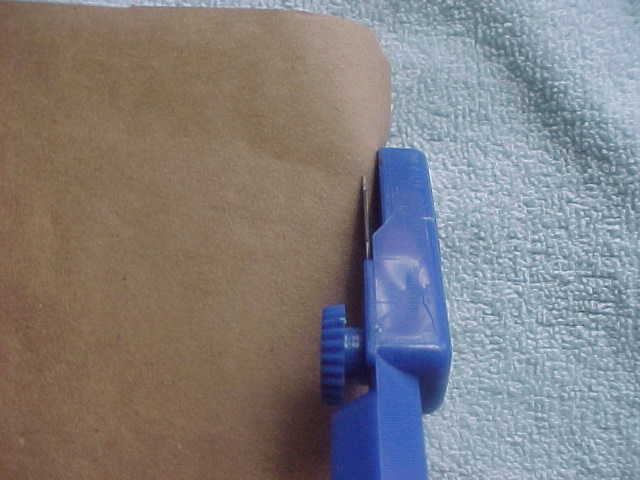 Use the blue dust cover trimming tool to remove the excess paper edge. This tool is so neat. See the little space between the blade and the blue head? Makes this trimming so neat! All that’s left to do is attach your hanger and optional rubber bumper pads to the four corners to protect the walls. Hope you enjoyed my tutorial!! I had fun making it. BTW, I use www.framingsupplies.com if I can’t buy locally. Not affiliated, just a satisfied customer. Awesome tutorial! Thank you so much for that. Your gingerbread cottage is beautiful. i love how you matted it and the frame is a perfect compliment to it. Lovely framing, Carol. 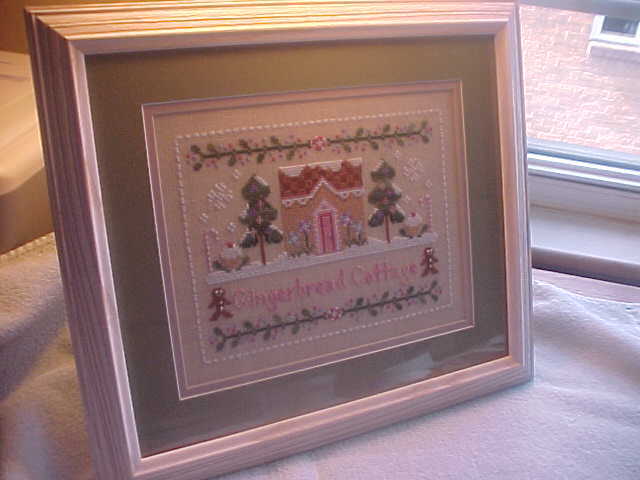 As you can see on my blog, I couldn’t resist and started Gingerbread Cottage. I blamed it on you for your work is too pretty ^.^ Thanx for the tutorial. Great framing tutorial. When I framed years ago I used the lace method but will give the pins a try when I finally get around to framing some pieces. The gingerbread cottage looks awesome in the frame. Well!!! You make it seem so easy…I think I’m going to Michael’s today! Thank you for your well written and totally awesome Tutorial! Thank you again, I’m definitely going to use this in the future! That is a great framing Tutorial. Thanks for sharing. Thanks for the tutorial have been trying to find how to info for a long time. Thank you so much, Carol! Very professional. I have a point driver. Now I just need a good cutter for the foam core board. I have always used sticky boards and I think your method may be better. Your Gingerbread Cottage is so pretty! Thanks you muchly, Carol. I have a lot of cross stitch to frame and I definitely will be trying out your method. It is the best and easiest that I have heard about yet. Will let you know the outcome! you are in point of fact a just right webmaster. The site loading speed is incredible. It sort of feels that you are doing any unique trick. In addition, The contents are masterpiece. you have performed a wonderful process in this subject! Needing to know specifically what the name of the pins used. You say they’re available in any craft store but I don’t know what I’m looking for and are they in the sewing section?